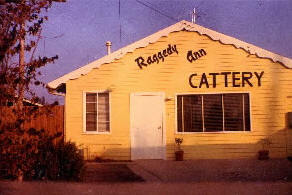 This is the birthplace where the Ragdoll breed began. The late Ann Baker of Riverside, California (USA) is the founder of the Ragdoll breed. Ann Baker recounted the history of the Ragdoll as follows: Ann's neighbour, Mrs Pennels, owned a white Angora-type female, called Josephine. Josephine often had kittens, but they were all wild like their mother. Josephine was run over by a car and left lying by the side of the road for a couple of days. Eventually she was taken to the local university for treatment. Ann firmly believed that during her time at the university, Josephine was "genetically manipulated", resulting in future kittens being loving, relaxed, "floppy" and unable to feel pain. Today, this belief in Josephine's genetic manipulation is rejected as a fallacy as the Ragdoll experiences pain in the same way as any other breed of cat. As far as the "floppiness" is concerned, kittens and cats from any breed could present this trait - it is not caused by any genetic characteristic, but rather by the way in which the kitten is raised and socialised. 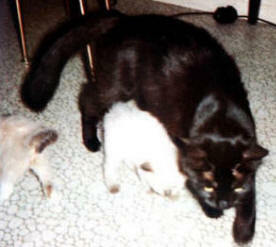 Ann acquired three of Josephine's half-related kittens from her neighbour – Pretty Boy, "a cat with the appearance of the Sacred Cat of Burma" (The Birman breed) which Ann later called Daddy Warbucks; Buckwheat (a black non-pointed female); and Fugianna (a badly marked Bicolour female). 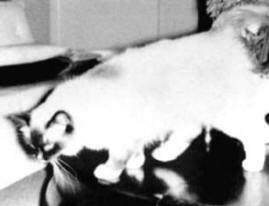 These three cats became the founding Ragdolls, producing the first Ragdoll kittens. 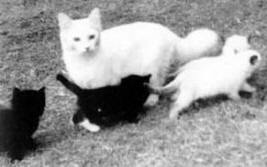 In the summer of 1965, a litter of four kittens were born - two pointed and two non-pointed kittens. Ann ruled the Ragdoll breeding programme with a strict hand, registering and patenting the name Ragdoll and franchising out future breeding stock under strict contracts. Remaining protective over her kittens, Josephine fought with the family dog. It is alleged that Mr Baker, who had had enough of Josephine's protectiveness, had Josephine and her kittens destroyed, thereby ending the life of the founding queen of the Ragdoll breed. Denny & Laura Dayton. They bought the first Ragdoll Breeders Rosie & Buddy from Ann Baker in 1969. Denny created the Ragdoll Genetic Chart and together they started the Ragdoll Society in 1975, it later became the RFC/RFCI. 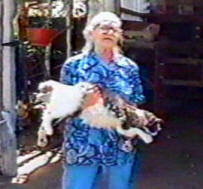 Ann Baker passed away in 1997.
carrying Siamese (pointed) markings, to other longhaired cats carrying Siamese markings. the look she wanted for her breeding program, she created the type standard for the Ragdoll. (1-2 weeks during spring and fall). many do not posses the “fight” instinct nor do they use their claws for self defense.